or A Performing Art Center in the Power of Ten. What is a performance? What is a Verb? For performance artists that centralize the issue of time, a simple action can always be deconstructed into secondary procedure sequence, which are often lost when the play is summarized as a verb of ‘fighting‘ or ‘eating’. The repetition of same actions estrange the familiar understanding of the same verb. The repeating layers divides the space and time, thus cut the understanding of the continuity of space and time. The performing center is no longer a stage, but a live archive of verbs. Every visitor is the learner as well as the exhibition for someone else. Unscripted act happens naturally when simple performance is elongated over hours. Unscripted act in the repeating scenes. Each program is not predefined room, but a type of action. Eating, climbing, swimming, reading are recurrently performed by those who are attending the events. The center become a live collection of Verbs. People could see the basic verb being deconstructed by those performers into a sequencing procedure. Whereas the very action they are performing, the Seeing/Filming/Spying/Peaking, become part of the art as well. Section showing repeating element and time. The two levels that defined by the natural geographical difference on the riverside park enables a dual directional of multiple layers that distort the perception of depth and transparency. 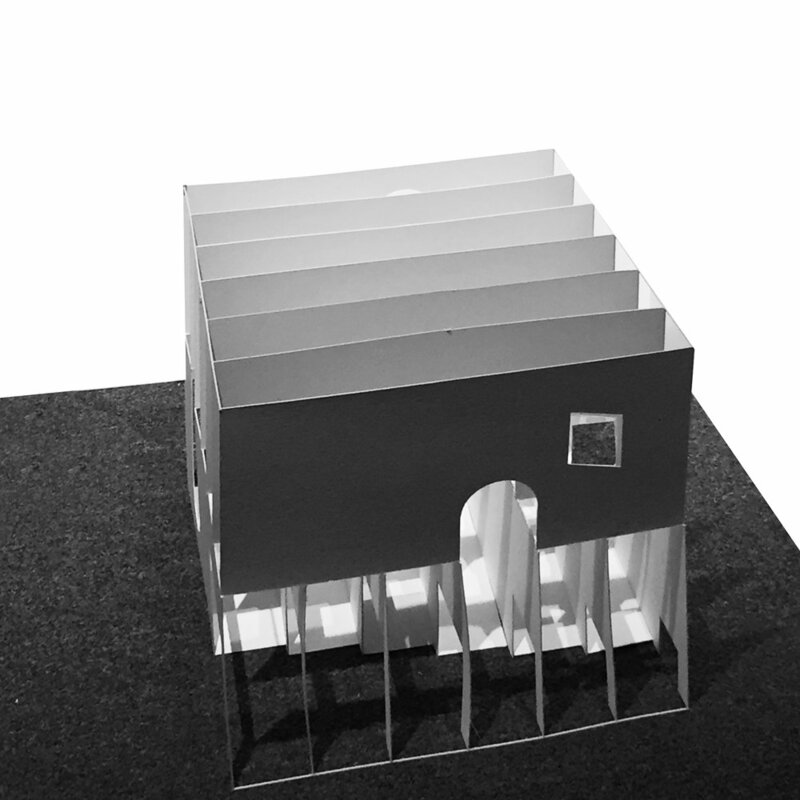 On the large scope of the park, a series of pavilion insertion on different locations fulfill the program demand for both local residence and museum visitors. Those insertions are formally in the same repeating fins language extension from the main verb museum. Parallel World in the Parallel Walls. The local topography difference is treated as an opportunity to incorporate two axis at each level. The riverside park, waterfront, highway and the train tunnel are interiorized as part of the precession at lower level, while the upper level aligned to the city street. 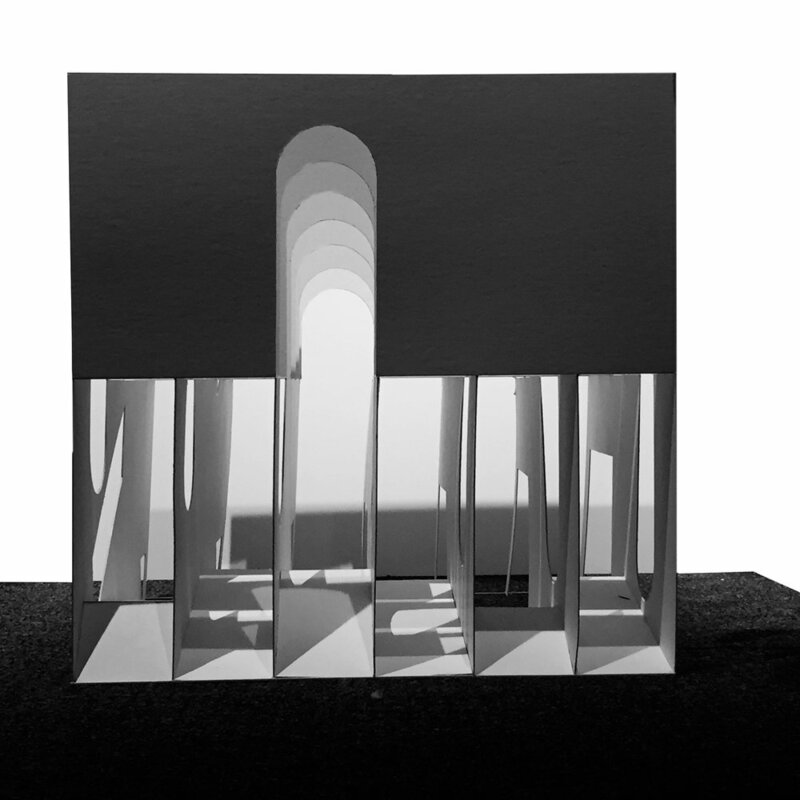 The parallel fins allows transparent view from the city to be maintained, while the variation of each layers allows each program to be individually facilitated between the layers, and within the layers. Perception of sample object changes when perceived from different directions. Vertical voyager enforce estrangement. It expands and compress each participants experience, creating elongation of time and rapid motion though the structure simultaneously. It enables abrupt changes in program within the layers that appear solid from outside.